2017 marked another record year for global car sales and SUVs. As the global economy stabilised, the car industry benefited from positive growth in most regions. 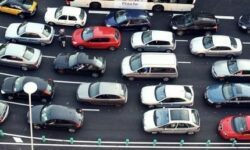 China maintained its spot as the world’s largest car market – although its growth was moderate – whilst the USA posted a small decline, but still registered more than 17 million units. Europe continued to grow despite uncertainty in the UK, and emerging markets like Brazil and Russia finally started to expand again. 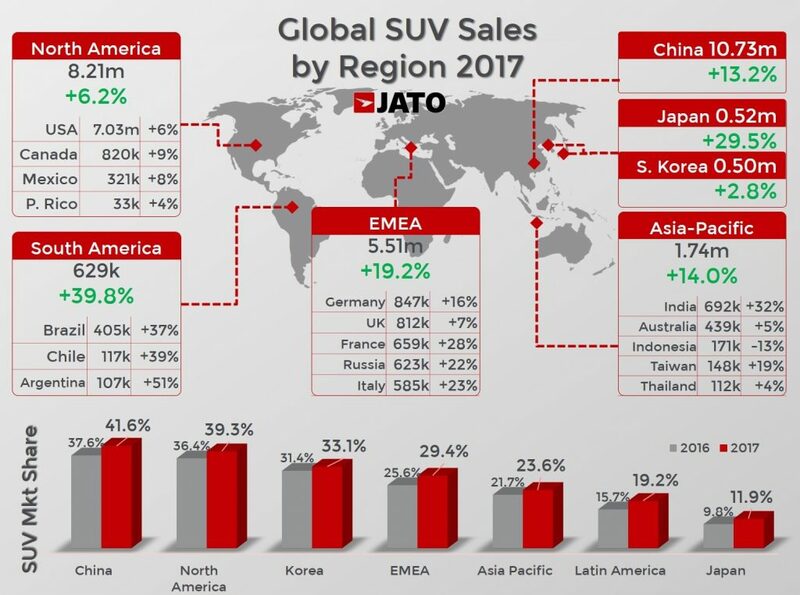 JATO’s analysis of 52 markets found that car sales totalled just over 86 million units in 2017, 2 million more units than the total registered in 2016, which equates to a 2.4% increase. 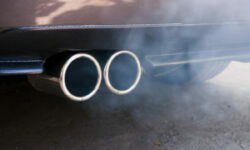 Most of this growth was driven by SUVs, which accounted for 32.4% of the total market (LCVs included) and almost 34% of the passenger car market (LCVs excluded). There was a record of 27.85 million new SUVs sold in 2017 – up by 12.7% compared to 2016 – confirming that the SUV boom is more than just a fad. 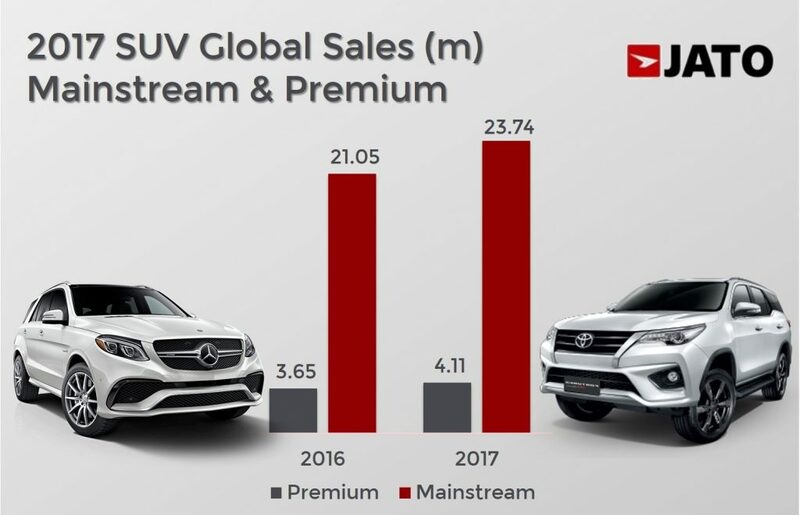 The global popularity of SUVs enabled the segment to increase its market share by almost three points in 2016-2017, and 11.5 points since 2014, when 16.66 million units were sold. 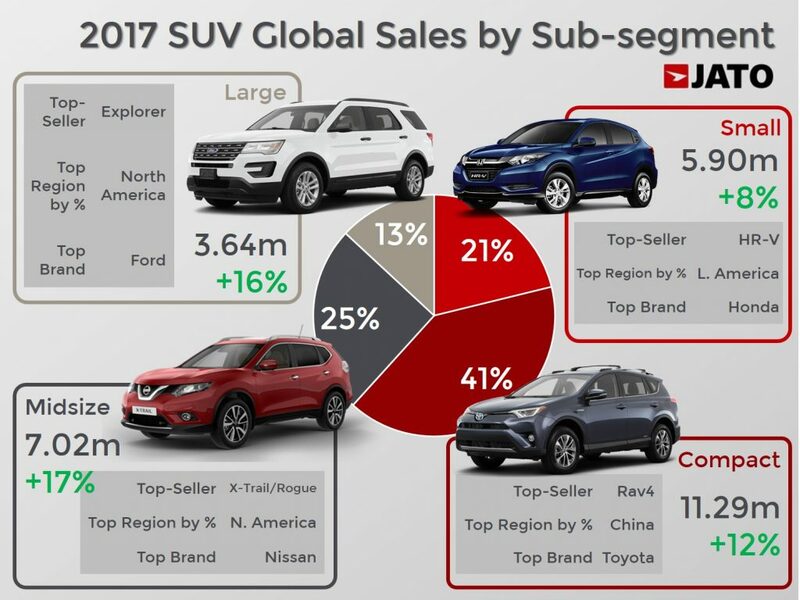 Whilst traditional segments like sedans, SWs and hatchbacks faced a tough year in 2017, SUVs recorded double-digit growth in China, Europe, Asia-Pacific, Japan, South Korea and Latin America. 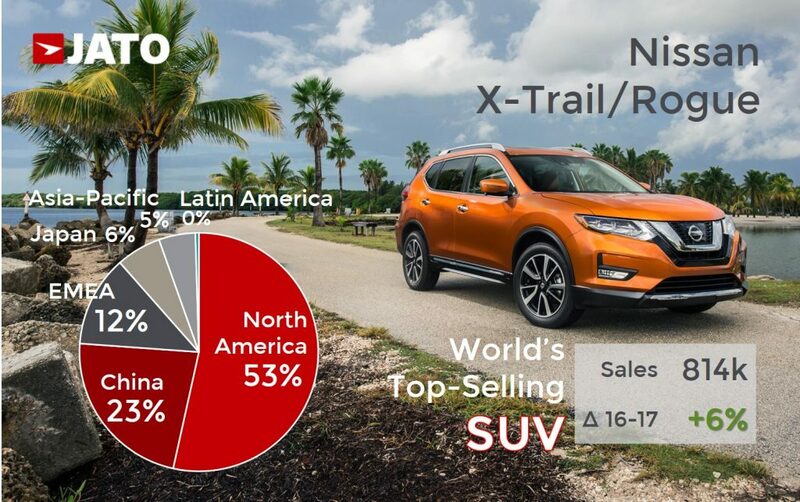 In North America, where the SUV’s success started, sales grew by 6.2%, which was a good result considering the overall market drops in the USA, Mexico and Puerto Rico. For the first time in their history, SUV sales exceeded 10 million units in China, with 10.73 million being sold in 2017. Volume grew by 13.2% as it was boosted by strong growth at GM, VW Group, Geely, Renault-Nissan, GAC, Dongfeng and SAIC. 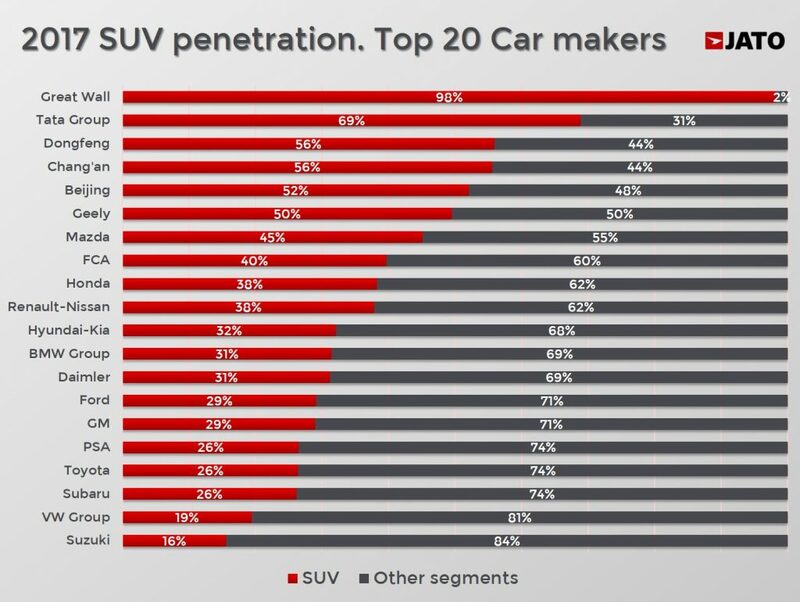 The Chinese SUV market is split by Chinese makers (52%) and foreign brands (48%). China was also the market where SUVs made up the largest percentage of its total sales, with the segment counting for 41.6% of the market. This was followed by North America (39.3%) and Europe-31 (29.5%). The segment made up the smallest percentage in Japan and Korea (17.4%) and Latin America (19.2%). 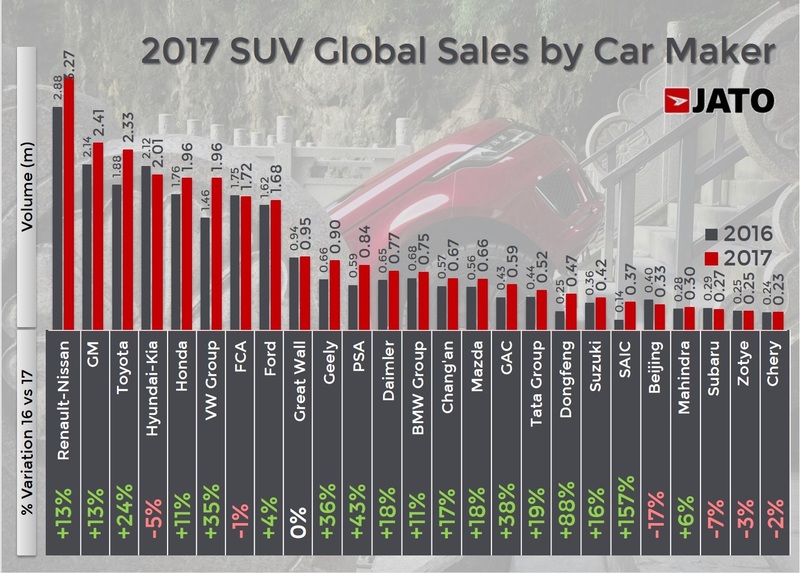 This shows that there are markets where SUVs still have big growth potential. This is particularly the case with Argentina, Malaysia, Turkey, Brazil, Mexico, India and South Africa, where the SUV’s market share is still under 25%, but growth is quite fast. 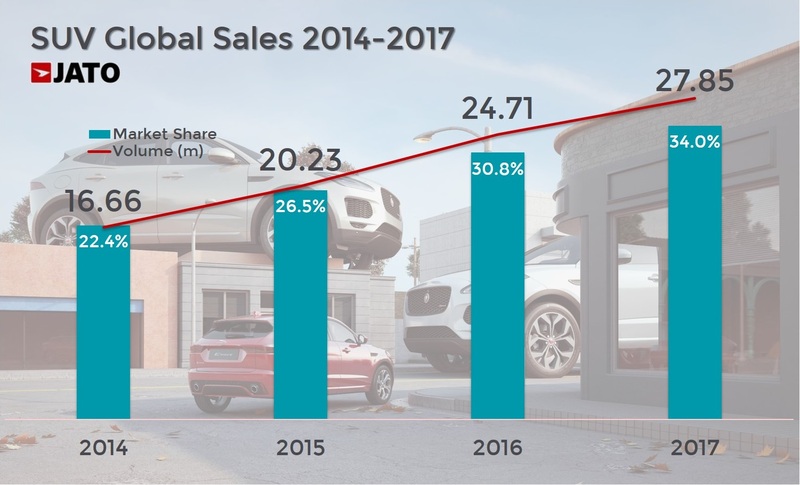 Car sales in these seven markets totalled 9.47 million units – or around 10% of the global total – , and SUVs market share was 19.4%, leaving a lot of room for further growth. We can expect the segment to grow even more in the future. Previously, major car makers like Volkswagen Group and Hyundai-Kia took a backseat when it came to SUVs. The Volkswagen brand finally got involved in the segment though after launching the Atlas/Teramont in the US and China, the T-Roc in Europe and a longer version of the Tiguan for global markets. Then Skoda introduced the Kodiaq and Karoq, and Seat brought the Ateca and Arona to the market. More are scheduled to come, with the VW T-Cross, Seat Tarraco and a smaller Skoda all set to be released. Meanwhile, Hyundai-Kia want to boost their sales with the launch of their first global small SUVs: the Hyundai Kona and Kia Stonic. Last year, all SUV sub-segments registered growth, with compact ones leading the charge with 11.29 million units sold, up by 11.8%. As Hyundai-Kia, the usual leader, recorded a drop, this growth was possible due to the successes of Toyota’s SUV range and Volkswagen’s Tiguan and Ateca models. 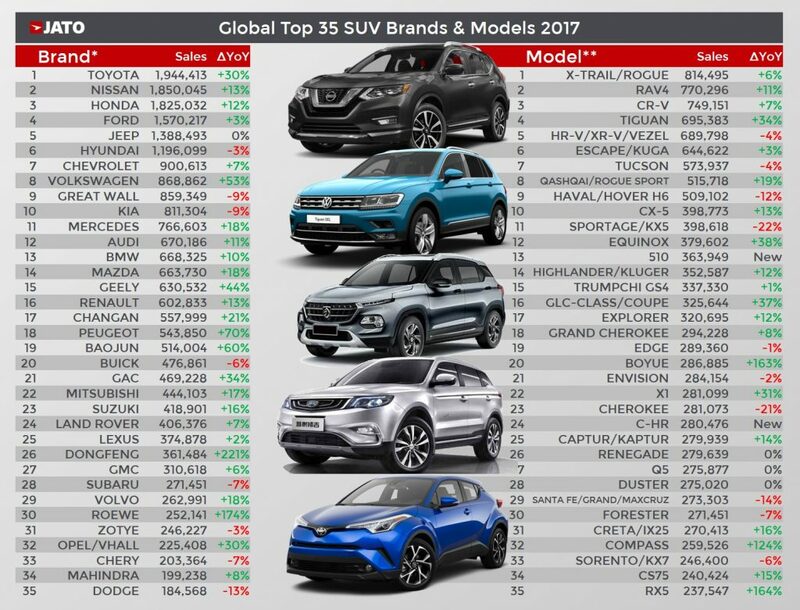 Midsize SUVs were the second largest SUV sub-segment at 7.02 million units, up by 16.6% thanks to double-digit growth posted by Renault-Nissan and its Nissan X-Trail/Rogue – the world’s best-selling SUV – and Toyota, which was boosted by the Highlander, Prado and Harrier. The small SUV sub-segment also performed well but at a slower pace than before, with volume up by 8.4% to 5.90 million units. This sub-segment is particularly popular in Latin America, where sales counted for 11.7% of the total market, followed by Asia-Pacific (9.4%) and Europe (9.0%). Renault-Nissan was the top-selling car maker in this sub-segment thanks to its popular Captur and Duster models. GM posted the biggest leap in this sub-segment, as its sales jumped by 84% following strong demand for the Baojun 510. Finally, big SUVs sold 3.64 million units, up by 15.7%. North America was by far the largest market for this sub-segment, counting for every two in three vehicles sold. However, China was responsible for a big part of overall growth as sales doubled, meaning it outsold Europe. The big Volkswagen Teramont (aka Atlas) and GAC’s Trumpchi GS8 explain this positive change. GM and Daimler also contributed to the growth of the sub-segment.